The Weld Mount System - How does it work? 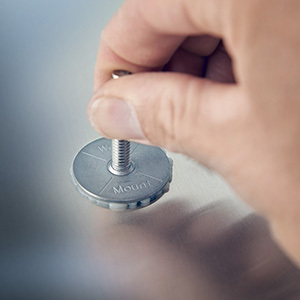 The Weld Mount System is a unique line of fasteners and adhesives designed to be adhesively bonded to almost any substrate. We offer wire tie mounts, hose and cable clamps, studs, standoffs, floating nut plates and other mounting solutions. All of our fasteners are mounted with our unique non-sag adhesives which hold the parts in place on a vertical or overhead surface providing permanent high strength bonds. 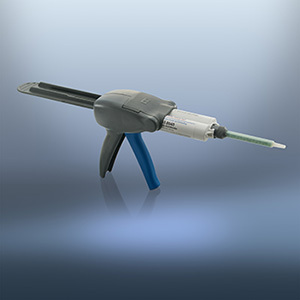 Our adhesives create structural bonds which provide excellent tensile strength in 20 to 30 minutes. Our system can be easily installed without extensive training, eliminating the high costs associated with welding or drilling and tapping. 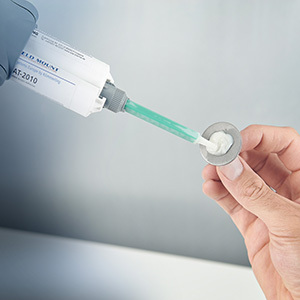 Mount the 2-component adhesive cartridge into the dispenser and mount the replaceable mixing tip. Clean fastener and substrate with scotchbrite and solvent. 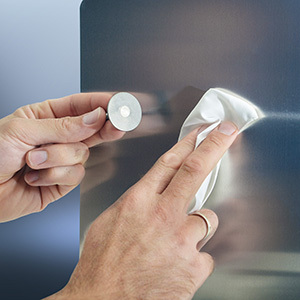 Squeeze the handle to dispense a small amount of adhesive onto the bottom of the part. Firmly push the part onto the substrate until the adhesive squeezes out from under the base. Depending on the adhesive selected the fastener is ready for use in 15 - 45 minutes.